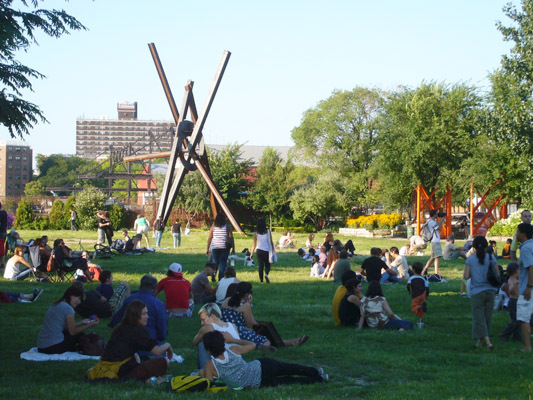 Mission: Socrates Sculpture Park is an internationally renowned outdoor venue for presenting public art and an artist residency program that also serves as a vital New York City park offering a wide variety of free public programs. Socrates Sculpture Park is the only site in the New York Metropolitan area specifically dedicated to providing artists with opportunities to create and exhibit large-scale sculpture and multi-media installations in a unique outdoor environment that encourages strong interaction between artists, artworks and the public. The Park’s existence is based on the belief that reclamation, revitalization and creative expression are essential to the survival, humanity and improvement of our urban environment. Representing a broad range of materials, working methods and subject matter, the Emerging Artist Fellowship Exhibition is an established annual study of contemporary sculpture in the public realm. Emerging Artist Fellowship recipients are granted financial support in the amount of $5,000, a residency in the outdoor studio (beginning in May 2013), and access to facilities, materials, equipment, and technical assistance to create a work for the annual Emerging Artist Fellowship Exhibition. A printed brochure and an electronic publication will accompany the exhibition and program. Fellowship artists are selected through an open application process. Proposals are reviewed by Socrates staff and curatorial advisors composed of prominent curators, artists, gallerists, and arts administrators. Following the first round of selections, Socrates staff members will contact applicants individually to discuss proposed projects before final selection and confirmation of fellowship. Accommodations: a residency in the outdoor studio (beginning in May 2013), and access to facilities, materials, equipment, and technical assistance to create a work for the annual Emerging Artist Fellowship Exhibition. Demographic: Fellowships are awarded to artists who would benefit from the opportunity and are New York State residents. Artists who are enrolled in a school, college, or university are not eligible for the Emerging Artist Fellowship Program. Artists who have applied before (but never shown at Socrates) are eligible to apply again.